File image of the Valero refinery in Benicia. California Attorney General Xavier Becerra today said he plans to seek an injunction blocking the proposed sale of a Martinez petroleum terminal to Valero Energy Corp.
Becerra said the Plains All American Pipeline terminal is the last independently owned terminal in Northern California not controlled by a refinery. The proposed sale would reduce competition and give refineries too much power to raise California's gas prices, which are already higher than the national average because of taxes and stricter environmental regulations, he said. "If all the terminals are owned by refineries, they could manipulate how much gas flows," Becerra said today at an event in San Francisco. "Anti-competitive behavior is never good for consumers." 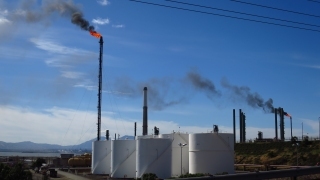 The motion for an injunction will be filed Monday in a federal anti-trust lawsuit initially filed by the state on June 30 challenging Valero's acquisition of two petroleum storage and distribution terminals owned by Plains in Martinez and Richmond. A state motion for a temporary restraining order was denied earlier this month. Valero CEO Joe Gorder and Plains CEO Greg Armstrong issued a joint statement last week saying they are disappointed by the attorney general's actions in challenging the sale. The companies argued that they do not compete in California and that the Federal Trade Commission has chosen to allow the sale to proceed. "As the FTC and California Attorney General know, Valero plans to meaningfully expand capacity at both the Martinez and Richmond Terminals, which will benefit customers as well as California consumers," the statement said. "Valero and Plains All American will continue to vigorously defend the planned transaction in federal court." A court hearing on the motion for an injunction is scheduled for mid-August, according to the attorney general's office.